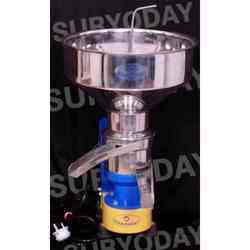 Our clients can avail from us a matchless range of Electric Driven Cream Separator. These machines are manufactured using high grade stainless steel that is sourced from trustworthy and reliable dealers. They are automatically operated and are highly appreciated for its durability and great results. Being the leaders in the industry, we present Electric Milk Cream Separator (AE - 29) 1000 LPH to our broad client network. The production capacity of this machine is 1000 liter per hour and is presented at the affordable rates to the clients. It is highly appreciated for its sturdy construction, long service life and high efficiency. Additionally, it is operated on 0.5 horse power pump and is available with 45 discs. Dynamically Balanced Ss Bowl With Ss Disc. We are the leading manufacturers and suppliers of Electric Milk Cream Separator (AE - 108) 500 LPH to our respected clients. It is manufactured by our team of experts in a very hygienic environment and is available at the best rates in the market. This machine is available in 110 volt/ 60 hertz, 230 volt and 50 hertz and is electric power driven with mono phase. The tank capacity of this machine is 40 liters and its production capacity is 400 liter per hour. Also, it is available with 35 discs. The highly talented team of our company presents Electric Milk Cream Separator (AE - 7) 60 LPH of fine quality. It is widely used in small scale industry and also for domestic purpose to separate the cream from the milk. The parts of this machine are fabricated using high grade stainless steel that is sourced from known and reliable dealers. Additionally, it is presented with 10 liter tank that is capable to produce 60 liter per hour of final product. Being the leaders in the industry, we present Electric Milk Cream Separator (AE - 9) 165 LPH to our esteemed clients. This machine is easy to operate and is presented at the best rates in the industry. It runs on 0.5 horse power and separates 165 liter per hour of cream. Cream separator is manufactured using premium grade raw material that is sourced from trusted and reliable dealers across the country. Also, the tank capacity of this machine is 15 liters and is available with 22 numbers of discs. Power Supply Available in 110 v / 60 Hz & 230 v / 440 v and 50 Hz . 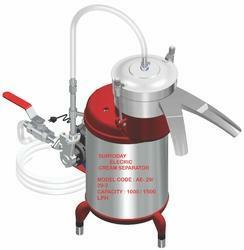 We are engaged in manufacturing and exporting a unique range of Electric Milk Cream Separator (AE - 29-2) 1500 LPH. 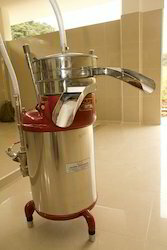 It is widely used in various industries and also in residence to separate cream and milk. The production capacity of this machine is 1500 liters per hour and is presented at the best rates in the industry. Number of disc present is 45 and it runs on 110 volts/ 60 Hertz, 230 volts/ 440 volts and 50 Hertz power. Additionally, it is fabricated using high grade stainless steel. Used in Private Dairy and Higher separation. 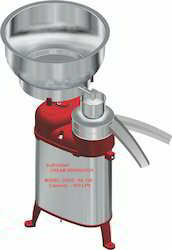 Being the leaders in the industry, we present Electric Milk Cream Separator (AE - 109) 700 LPH. Its tank capacity is 40 liters and production capacity is 700 liters per minute and is highly appreciated for its durability and long service life. This machine is available in 110 volt/ 60 hertz, 230 volt and 50 hertz and consumes less power. All the parts of this machine that collect milk are made from SS 304 materials and are presented at the industry leading rates to the clients. 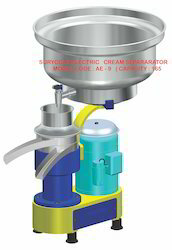 Looking for Electric Driven Cream Separator ?